Bones can be classified on the basis of their position, shape, size, or structure. In the long bones, the epiphysis is the region between the growth plate or growth plate scar and the expanded end of bone, covered by articular cartilage. An epiphysis in a skeletally mature person consists of abundant trabecular bone and a thin shell of cortical bone (see the image below). Although an epiphysis is present at each end of the long limb bones, it is found at only one end of the metacarpals (proximal first and distal second through the fifth metacarpals), metatarsals (proximal first and distal second through fifth metatarsals), phalanges (proximal ends), clavicles, and ribs. Cortical bone is composed of haversian systems (osteons). Each osteon has a central haversian canal and peripheral concentric layers of lamellae. The epiphysis is the location of secondary ossification centers during development. The structure of the epiphysis is more complex in bones that are fused from more than one part during development. Examples include the proximal and distal ends of the humerus, femur, and vertebrae. For instance, the proximal end of the humerus is developed from three separate ossification centers, which later coalesce to form a single epiphyseal mass. In the proximal humeral epiphysis, one of the centers forms the articular surface, and the other two become the greater and lesser tuberosities. Carpal bones, tarsal bones, and the patella are also called epiphysioid bones and are developmentally equivalent to the epiphyses of the long bones. Knowledge of the location of the epiphysis and its equivalents in various bones aids clinicians in the recognition of the origin of bone lesions and further facilitates the diagnostic considerations, as some bone tumors such as chondroblastoma have a strong predilection for the epiphysis or epiphysioid bones. The metaphysis is the junctional region between the growth plate and the diaphysis. The metaphysis contains abundant trabecular bone, but the cortical bone thins here relative to the diaphysis. This region is a common site for many primary bone tumors and similar lesions. The relative predilection of osteosarcoma for the metaphyseal region of long bones in children has been attributed to the rapid bone turnover due to extensive bone remodeling during growth spurts (see Growth, Modeling, and Remodeling of Bone below). Osteosarcoma is a malignant primary bone tumor that is characterized by neoplastic osteoblasts that produce osteoid. Because of increased osteoblastic activity, the serum level of alkaline phosphatase is often significantly increased in this disease; however, acid phosphatase is synthesized by osteoclasts and will not be significantly increased in this disease, although scattered osteoclasts can also be present. The Codman triangle is a pattern of periosteal reaction that is often associated with osteosarcoma, although this pattern may also be seen with other aggressive processes, including osteomyelitis. The diaphysis is the shaft of long bones and is located in the region between metaphyses, composed mainly of compact cortical bone. The medullary canal contains marrow and a small amount of trabecular bone. Bone has a rich vascular supply, receiving 10-20% of the cardiac output. The blood supply varies with different types of bones, but blood vessels are especially rich in areas that contain red bone marrow. The diaphyseal nutrient artery is the most important supply of arterial blood to a long bone. One or two principal diaphyseal nutrient arteries first pass obliquely through the cortical bone. These arteries then divide into ascending and descending branches and supply the inner two thirds of the cortex and medullary cavity. Numerous metaphyseal and epiphyseal arteries supply the ends of bones. These blood vessels mainly arise from the arteries that supply the adjacent joint, anastomose with the diaphyseal capillaries, and terminate in bone marrow, cortical bone, trabecular bone, and articular cartilage. In growing bones, these arteries are separated by the epiphyseal cartilaginous plates. Several periosteal arterioles supply the outer layers of cortical bone. These bones receive a superficial blood supply from the periosteum, as well as frequently from large nutrient arteries that penetrate directly into the medullary bone. The two systems anastomose freely. Blood is drained from bone through veins that accompany the arteries and frequently leaves through foramina near the articular ends of the bones. 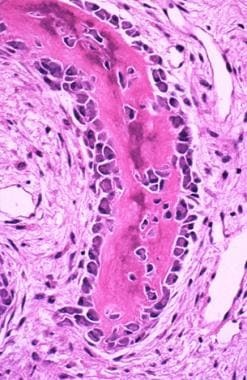 Lymph vessels are abundant in the periosteum. Nerves are most rich in the articular extremities of the long bones, vertebrae, and larger flat bones. Many nerve fibers accompany the blood vessels to the interior of the bones and to the perivascular spaces of the haversian canals. The periosteal nerves are sensory nerves, some of which are pain fibers. Therefore, the periosteum is especially sensitive to tearing or tension. Accompanying the arteries inside the bones are vasomotor nerves, which control vascular constriction and dilation. 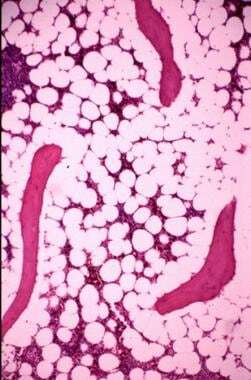 Trabecular bone and the surrounding hematopoietic cells, as well as adipose tissue in medullary cavity. Mature trabecular bone exhibits lamellae and osteocytes between the lamellae. Inactive osteocytes are also present on the bone surface with a flattened shape. In contrast to compact bone, complete osteons are usually absent in sponge bone because of the thinness of the trabeculae. Sponge bone is also more metabolically active than compact bone because of its much larger surface area for remodeling. Woven bone under a polarized microscope; collagen fibers are arranged in disorganized arrays. Tendon insertion site in adults. Osteon of mature bone viewed under a polarized microscope; lamellae are shown as alternating dark and bright layers due to the perpendicular orientation of the collagen fibers in the neighboring lamellae. 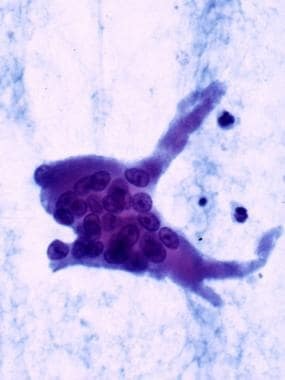 Osteoblasts in cytologic preparation (Diff-Quik stain). Each active osteoblast has eccentrically located nuclei with a conspicuous nucleus and a perinuclear halo, resembling a plasma cell. However, the osteoblast does not exhibit the clock-face or wheel-like chromatin pattern that is seen in a plasma cell. Although an active osteoblast (see the image below) has a cuboidal or columnar shape with an eccentrically located nucleus and a perinuclear cytoplasmic halo, an inactive osteoblast has a flattened shape with low alkaline phosphatase activity. Osteoblasts contact their neighboring osteoblasts cytoplasmically. Active osteoblasts depositing osteoid on the surface of a woven bone trabecula. Osteoblasts are columnar or cuboidal shaped, with eccentric nuclei and perinuclear halo. These cells also have polarity, with the cytoplasm toward the bone but the nuclei at the end away from the bone. Osteoblasts do not divide. They give rise to osteocytes, remain as osteoblasts, or return to the state of osteoprogenitor cells from which they derived. An osteoblast becomes an osteocyte when the cell is encased by osteoid matrix that it synthesizes itself. Lacunae and canaliculi form around the osteocyte and its cytoplasmic processes, respectively. Thus, an osteocyte lies in its own lacuna and contacts its neighboring osteocytes cytoplasmically through canaliculi (see the image below). Osteocytes are present in lacunae; their cytoplasmic processes contact each other through the canaliculi. Although osteocytes have reduced synthetic activity and are not capable of mitotic division, they are actively involved with the maintenance of the bony matrix. Some of the osteocytes die during remodeling, but most probably return to the state of osteoprogenitor cells or persist as osteocytes for a long time. Osteoclasts (see the image below) are probably derived from a monocytic-macrophage system and are responsible for bone resorption. [2, 19, 20, 21, 22, 13, 23, 24] They are multinucleated cells with fine, fingerlike cytoplasmic processes and are rich in lysosomes that contain tartrate-resistant acid phosphatase (TRAP). Osteoclast in a cytologic preparation (Papanicolaou stain). This image shows multiple nuclei and cytoplasmic processes. 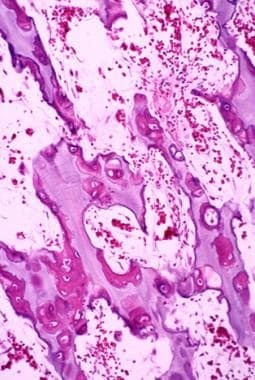 Osteoclasts lie in resorption craters known as Howship lacunae (see the image below) on bone surfaces or in deep resorption cavities called cutting cones. These bone cells can only resorb mineralized bone matrix. Remodeling of bone. Multiple osteoclasts are sitting in the Howship lacunae, resorbing one side of a bony trabecula, while osteoblasts are depositing new bone on the other side. Cells that express the full morphologic and functional properties of mature osteoclasts are known to be restricted to the surfaces of bones. Osteoclast transmigration on the bone surface has been assumed to be for the purpose of bone resorption. A study by Saltel et al appeared to have demonstrated a new property of mature osteoclasts: transmigration through bone tissues of various cell types. The authors' results may have implications for therapeutic strategies for bone diseases with an imbalance in bone remodeling that is caused by excessive osteoclast resorption. Osteoclasts or their committed precursors do not have receptors for parathyroid hormone. The hormonal signal is mediated by osteoblasts. However, osteoclasts do have receptors for calcitonin. When in an active state, osteoclasts create an effect that always predominates over that of osteoblasts because osteoclasts are three times more efficient at bone resorption than osteoblasts are at bone deposition. In balance, osteoclasts have a much shorter life span than osteoblasts. 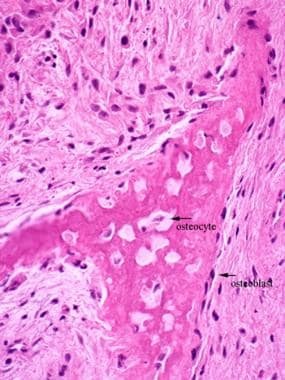 Osteoclasts are rarely seen in routine histologic sections of normal bone. An increased number of osteoclasts is characteristic of diseases with increased bone turnover. Bone matrix consists of organic and inorganic components. The association of organic and inorganic substances gives bone its hardness and resistance. The organic component is composed of collagen fibers with predominately type I collagen (95%) and amorphous material, including glycosaminoglycans that are associated with proteins. [29, 30] Osteoid is uncalcified organic matrix. Inorganic matter represents about 50% of the dry weight of bone matrix, composed of abundant calcium and phosphorus, as well as smaller amounts of bicarbonate, citrate, magnesium, potassium, and sodium. Calcium forms hydroxyapatite crystals with phosphorus but is also present in an amorphous form. 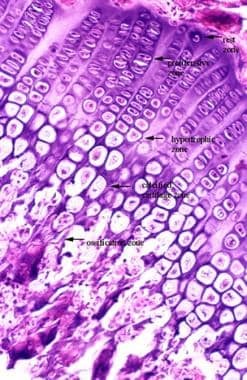 During bone remodeling, osteoblasts deposit a layer of osteoid seam (approximately 10 µm thick) on the surface of preexisting bone, which then begins to mineralize in approximately 20 days. This interval is known as the mineralization lag time. 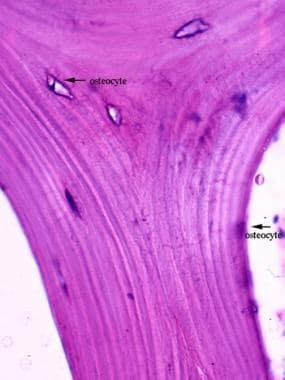 In the histology of normal bone, as a result of the normal remodeling process, up to 20% of the bone surface may be covered by osteoid (usually 10 µm thick). An increased amount of osteoid is seen in pathologic conditions in which the remodeling rate is accelerated or in which the mineralization lag time is increased. The primary structural unit of compact bone is the haversian system. Each haversian system is a long, often bifurcated, cylinder that is parallel to the long axis of bone, formed by successive deposition of four to 20 (average, six) concentric layers of lamellae. Collagen fibers are parallel to each other within each lamella, but they are oriented perpendicularly to the fibers in the neighboring lamellae. Such an arrangement can be highlighted as alternating bright and dark layers in polarized microscopy (see the image below). Lamellar deposition starts from the periphery, so that younger lamellae are closer to the center of the system, and the younger systems have larger canals. Between the lamellae are lacunae that contain the cell bodies and canaliculi that hold the cytoplasmic processes of osteocytes. 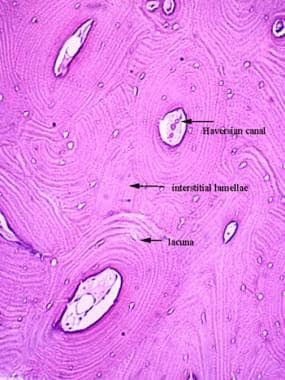 In the center of each haversian system is a haversian canal, which is lined by endosteum and contains a neurovascular bundle and loose connective tissue. The haversian canals connect with each other by transverse or oblique Volkmann canals that communicate with the marrow cavity and the periosteum to provide channels for the neurovascular system. 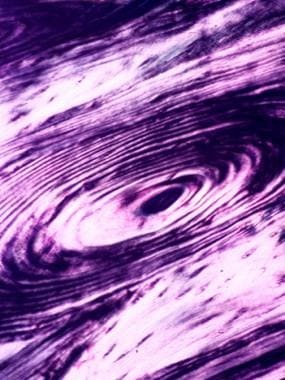 Volkmann canals are not surrounded by concentric lamellae; rather, they perforate the lamellae. Interstitial lamellae are incomplete or fragmented osteons that are located between the secondary osteons. They represent the remnant osteons left from partial resorption of old osteons during bone remodeling. The mixture of interstitial lamellae and complete osteons produces a mosaic pattern. Thus, the age of the bone can be deduced from the proportion of interstitial lamellae and intact osteons. Younger bone has more complete osteons and less interstitial lamellae in between the osteons. Circumferential lamellae are circular lamellae that line the external surface of the cortex adjacent to the periosteum and line the inner surface of the cortex next to the endosteum. There are more outer than inner circumferential lamellae. Bone tissue arises either through intramembranous ossification or through endochondral ossification. [6, 33, 34] In either case, the original or model tissue is gradually destroyed and replaced with bone tissue. Bone forms only by appositional deposition of matrix on the surface of a preformed tissue. Woven bone is initially formed and is then later converted to lamellar bone by subsequent remodeling. Although intramembranous ossification (see the image below) is the source of flat bones, this process also contributes to the growth of short bones and thickening of long bones. Interstitial membranous ossification takes place within a condensation of mesenchymal tissue. The process begins when multiple groups of cells differentiate into osteoblasts in a primary ossification center. Intramembranous ossification. Woven bone arises directly from the surrounding mesenchymal tissue. Osteoid is synthesized and then mineralized surrounding the osteoblasts, which then become osteocytes. When these ossification centers fuse, a loose trabecular structure known as primary spongiosa is formed. Subsequently, blood vessels grow into the connective tissue between the trabeculae. Bone marrow stem cells from the circulating blood then give rise to hematopoietic cells. Growth and fusion of several ossification centers (see the image below) eventually replace the original mesenchymal tissue. In flat bones, compact bone is formed at both the internal and external surfaces due to a marked predominance of bone deposition over bone resorption, whereas a spongy pattern remains in the central portion. The endosteum and periosteum are formed from layers of connective tissue that are not undergoing ossification. Primary calcification center of fetal bone. Endochondral ossification (see the image below) is responsible for the formation of short and long bones. This process takes place within a hyaline cartilage model, which provides a template of the shape of the bone to be formed. Endochondral ossification in a primary ossification center of a fetal chondral model. 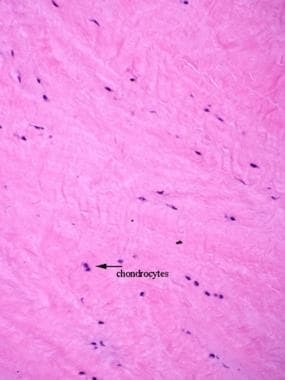 The chondrocytes are hypertrophic. Early calcification starts in the matrix between the chondrocytes. The surface of the chondral model is covered by perichondrium, which later becomes the periosteum. Endochondral ossification can be divided into two phases. In the first phase, chondrocytes of the model are hypertrophic and degenerated, and then the intervening chondroid matrix is calcified. In the second phase, osteogenic buds, composed of osteoprogenitor cells and blood capillaries, invade the spaces left by the degenerating chondrocytes. 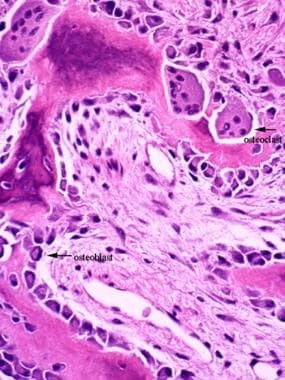 Osteoblasts arise from osteoprogenitor cells and lay down a layer of rapidly mineralized osteoid on the surface of calcified cartilage. The complex structure of calcified cartilage with overlying newly bone thus formed is known as the primary spongiosa, which is later remodeled to become lamellar bone (secondary spongiosa). Calcified cartilage remnants are resorbed by chondroclasts, which are structurally and functionally equivalent to osteoclasts, except that chondroclasts work on cartilage rather than bone. Thus, the cartilage model is gradually replaced by bone and marrow cavities. Long bones are formed from cartilaginous models. The primary ossification center is initiated by intramembranous ossification that is produced by the deep portions of the perichondrium that surround the diaphysis. A bone collar is thus formed, blocking the nutrient diffusion and leading to the degeneration of internal chondrocytes. 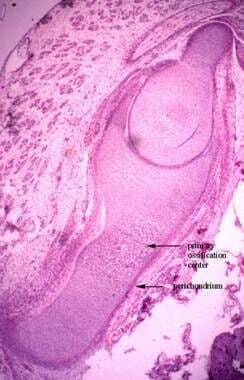 The perichondrium then becomes the periosteum, from which the osteogenic bud arises and penetrates the calcified cartilage matrix through passages that are created in the bone collar by osteoclasts. The primary ossification center expands longitudinally and is associated with the growth of the periosteal bone collar. Osteoclasts  are activated at the beginning of the process, resorb the bone at the center, and hence create the marrow cavity. At a later stage of bone development, a secondary ossification center arises at the center of each epiphysis. Unlike primary ossification, which expands in a longitudinal fashion, the secondary ossification center grows in a radial fashion. Furthermore, a bone collar is not formed in the area of articular cartilage due to the absence of perichondrium in this area. Thus, the epiphysis of the chondroid model is replaced by bone tissue, except the articular cartilage and the epiphyseal cartilage. Primary spongiosa in the ossification zone of growth plate. The osteoid is deposited at the periphery of calcified cartilage. During growth, the epiphyseal plate normally does not change in thickness, because the rates of proliferation and destruction are approximately equal. It is simply replaced away from the middle of the diaphysis, resulting in longitudinal growth of the bone. When the epiphyseal plate closes, between ages 16 and 20 years, longitudinal growth of bones becomes impossible, though widening may still occur through appositional growth. Much as in development, bone also grows by either endochondral ossification or intramembranous ossification. Whereas endochondral ossification of the epiphyseal plate is responsible for longitudinal growth of the long bones, periosteal deposition contributes to both the length and thickness of long bones, as well as the overall growth of flat bones. Endosteal bone deposition contributes to the growth of trabecular bone and the endosteal cortex, including the haversian system. The ongoing process that alters the size and shape of bone by partial resorption of preformed bone tissue and simultaneous deposition of new bone is modeling and remodeling. [1, 2, 3, 4, 5, 6, 7, 8] This process begins when a new bone is formed. Modeling is a process in which bone is sculpted during growth so as ultimately to achieve its proper shape. Modeling is responsible for circumferential growth of the bone and expansion of the marrow cavity, modification of the metaphyseal funnel of long bones, and enlargement of the cranial vault curvature. Remodeling is a continuous process throughout life, in which damaged bone is repaired, ion homeostasis is maintained, and bone is reinforced for increased stress. In adults, the remodeling rate varies in different types of bones. Trabecular bone is remodeled at a higher rate (25% per year) than cortical bone is (3% per year) in a healthy adult. Resorption and deposition are normally balanced, and bone density is maintained. A lytic lesion results when resorptive activity exceeds deposition activity in a pathologic state. The cement line (reversal line) is evidence of previous remodeling activity and is formed by filling of new bone in a previously resorbed cavity (see the image below). 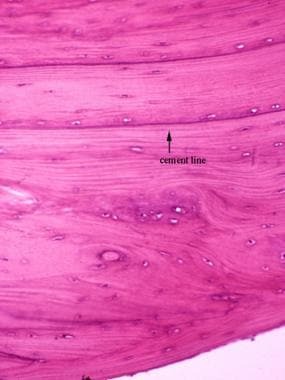 The cement line is strongly basophilic because of the high content of inorganic matrix and is normally found in the haversian and interstitial systems of adult bone. The cement line is evidence of a previous remodeling process. The relative amount of cement lines corresponds to the amount of remodeling that has occurred. An entire remodeling cycle requires approximately 6 months. Although a cement line that results from normal remodeling is relatively long and straight, an indented or mosaic pattern indicates a pathologically accelerated remodeling process. 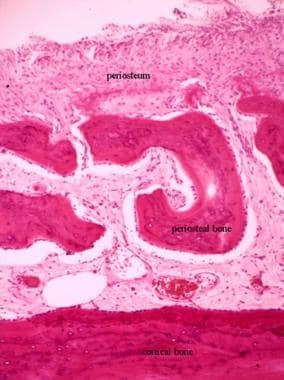 The periosteum is composed of an inner cambium layer that is immediately adjacent to the bone surface and an outer dense fibrous layer. 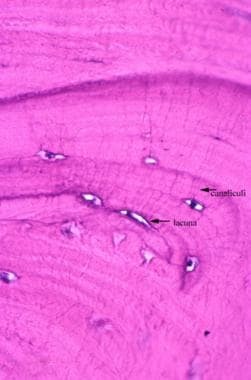 The cambium layer consists of osteoprogenitor cells, which are flat and spindle-shaped and are capable of differentiating into osteoblasts and forming bones in response to various stimulations (see the image below). Periosteal bone formation on the surface of cortical bone. New bone is deposited by osteoblasts derived from progenitor cells in the cambium layer of the periosteum. The collagen fibers in the outer layer are contiguous with the joint capsule, ligament, and tendons. In children the periosteum is thick and loosely attached to the cortex, whereas in adults, it is thinner and more adherent. The periosteum completely covers a bone, except in the region of the articular cartilage and at sites of muscle attachments. It is somewhat anchored to the cortex by Sharpey fibers that penetrate into the bone. The periosteum carries a dense network of blood, lymphatic vessels, and predominantly sensory nerves for maintenance of the bone structure. Different patterns of periosteal stimulation result in different patterns of periosteal bone formation. Continual insult results in streams of periosteal bone that are perpendicular to the bone surface, resulting in a hair-on-end appearance on radiographs. Intermittent periosteal stimulation results in multiple partially separated streams of periosteal bone that are parallel to the bone surface, giving an onionskin appearance on radiographs. 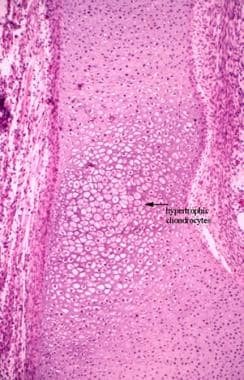 The endosteum is composed of osteoprogenitor cells and only a small amount of connective tissue, covering the surface of bone trabeculae and the medullary surface of cortical bone and haversian canals. The endosteum serves as one of the functional surfaces for bone remodeling. The articular cartilage can be divided into 3 zones. 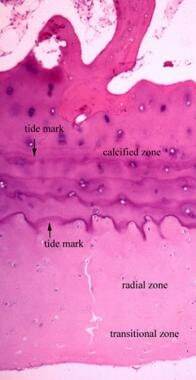 The calcified zone is separated from the upper zone by a calcified line termed the tidemark. Duplication of the tidemark can be seen with aging, when the calcified cartilage is gradually replaced by endochondral bone formation. Consequently, the calcified zone pushes into the upper zone. The joint capsule is made of dense, collagenous fibrous tissue, which blends with the periosteum on either side of the joint. Connective tissue on the inside of the joint capsule is looser and covered by synovial membrane. 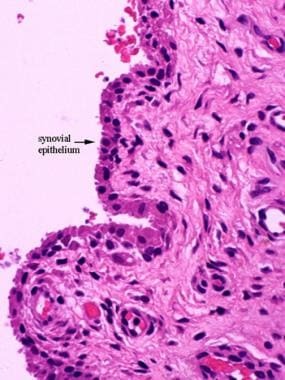 The synovial membrane is composed partly of smooth connective tissue and partly of villous connective tissue that is covered by a layer of synovial epithelium (see the image below). Two types of cells line the synovium. 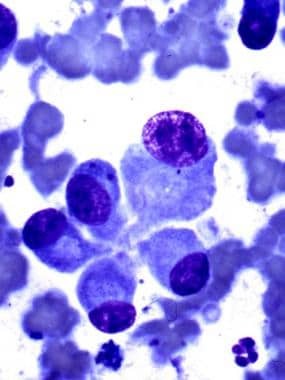 Type A cells are phagocytic cells that are more prominent in the reactive synovium. Type B cells are fibroblastlike cells that secrete hyaluronic acid and predominate under normal conditions. Synovial membrane is partly a smooth connective tissue and partly a villous fibrovascular connective tissue that is lined by a single layer of synovial epithelium. The intervertebral disc is composed of a central nucleus pulposus that is surrounded by an annulus fibrosus. The nucleus pulposus consists of scattered rounded cells in a viscous liquid that is rich in hyaluronic acid, similar to articular cartilage. The annulus fibrosus is composed of fibrocartilaginous tissue. The meniscus of the knee joint is made of dense fibrous tissue and fibrocartilage (see the image below). The meniscus is composed of fibrocartilage. 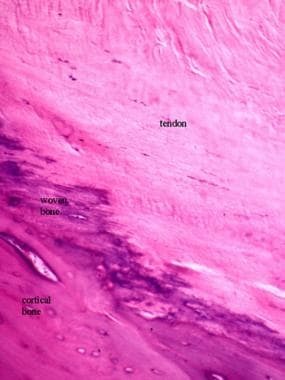 Tendons are composed of dense collagenous tissue. At the site that attaches to the bone, a tendon gradually transforms to fibrocartilaginous tissue. 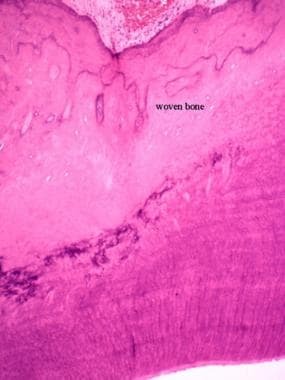 Woven bone can sometimes be seen at tendinous insertions. Chondroid metaplasia is also observed in tendons that are subjected to compression as they pass over bone. Deng ZL, Sharff KA, Tang N, Song WX, Luo J, Luo X, et al. Regulation of osteogenic differentiation during skeletal development. Front Biosci. 2008 Jan 1. 13:2001-21. [Medline]. Kollet O, Dar A, Lapidot T. The multiple roles of osteoclasts in host defense: bone remodeling and hematopoietic stem cell mobilization. Annu Rev Immunol. 2007. 25:51-69. [Medline]. Hadjidakis DJ, Androulakis II. Bone remodeling. Ann N Y Acad Sci. 2006 Dec. 1092:385-96. [Medline]. Adler CP. Normal anatomy and histology. Bone Diseases: Macroscopic, Histological, and Radiological Diagnosis of Structural Changes in the Skeleton. 2nd ed. New York: Springer-Verlag; 2000: 13-30. McCarthy EF, Frassica FJ. Anatomy and physiology of bone. Pathology of Bone and Joint Disorders: With Clinical and Radiographic Correlation. 2nd ed. Cambridge, United Kingdom: Cambridge University Press; 2015. 24-45. Kerr DA, Rosenberg AE. Bone. Mills SE, ed. Histology for Pathologists. 5th ed. Philadelphia: Wolters Kluwer; 2020. Chap 4. Moore KL, Dalley AF, Agur AMR. Skeletal system. Clinically Oriented Anatomy. 8th ed. Philadelphia: Wolters Kluwer; 2018. 18-27. Mescher AL. Bone. Junqueira's Basic Histology. 14th ed. New York: McGraw-Hill; 2016. 138-60. Nijweide PJ, Burger EH, Feyen JH. Cells of bone: proliferation, differentiation, and hormonal regulation. Physiol Rev. 1986 Oct. 66(4):855-86. [Medline]. Cooper RR, Milgram JW, Robinson RA. Morphology of the osteon. An electron microscopic study. J Bone Joint Surg Am. 1966 Oct. 48(7):1239-71. [Medline]. [Full Text]. Unger NJ, Odörfer KI, Weber K, Sandgren EP, Erben RG. Utility of human placental alkaline phosphatase as a genetic marker for cell tracking in bone and cartilage. Histochem Cell Biol. 2007 Jun. 127(6):669-74. [Medline]. Furlan F, Galbiati C, Jorgensen NR, Jensen JE, Mrak E, Rubinacci A, et al. Urokinase plasminogen activator receptor affects bone homeostasis by regulating osteoblast and osteoclast function. J Bone Miner Res. 2007 Sep. 22 (9):1387-96. [Medline]. Thommesen L, Stunes AK, Monjo M, Grøsvik K, Tamburstuen MV, Kjøbli E, et al. Expression and regulation of resistin in osteoblasts and osteoclasts indicate a role in bone metabolism. J Cell Biochem. 2006 Oct 15. 99 (3):824-34. [Medline]. Byun IS, Sarkar SK, Anirban Jyoti M, Min YK, Seo HS, Lee BT, et al. Initial biocompatibility and enhanced osteoblast response of Si doping in a porous BCP bone graft substitute. J Mater Sci Mater Med. 2010 Jun. 21 (6):1937-47. [Medline]. Chauhan VS, Marriott I. Differential roles for NOD2 in osteoblast inflammatory immune responses to bacterial pathogens of bone tissue. J Med Microbiol. 2010 Jul. 59 (Pt 7):755-62. [Medline]. Bassett JH, Boyde A, Howell PG, Bassett RH, Galliford TM, Archanco M, et al. Optimal bone strength and mineralization requires the type 2 iodothyronine deiodinase in osteoblasts. Proc Natl Acad Sci U S A. 2010 Apr 20. 107 (16):7604-9. [Medline]. Hirose S, Li M, Kojima T, de Freitas PH, Ubaidus S, Oda K, et al. 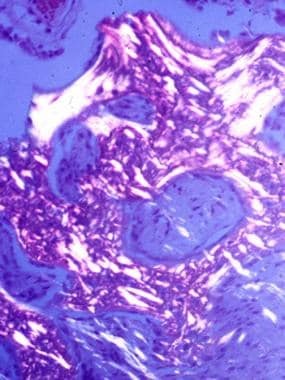 A histological assessment on the distribution of the osteocytic lacunar canalicular system using silver staining. J Bone Miner Metab. 2007. 25 (6):374-82. [Medline]. Jiang JX, Siller-Jackson AJ, Burra S. Roles of gap junctions and hemichannels in bone cell functions and in signal transmission of mechanical stress. Front Biosci. 2007 Jan 1. 12:1450-62. [Medline]. [Full Text]. Henriksen K, Leeming DJ, Byrjalsen I, Nielsen RH, Sorensen MG, Dziegiel MH, et al. Osteoclasts prefer aged bone. Osteoporos Int. 2007 Jun. 18 (6):751-9. [Medline]. Karsdal MA, Martin TJ, Bollerslev J, Christiansen C, Henriksen K. Are nonresorbing osteoclasts sources of bone anabolic activity?. J Bone Miner Res. 2007 Apr. 22(4):487-94. [Medline]. Athanasou NA. Cellular biology of bone-resorbing cells. J Bone Joint Surg Am. 1996 Jul. 78(7):1096-112. [Medline]. [Full Text]. Mundy GR. Bone resorption and turnover in health and disease. Bone. 1987. 8 (suppl 1):S9-16. [Medline]. Miller SC, Bowman BM. Rapid inactivation and apoptosis of osteoclasts in the maternal skeleton during the bone remodeling reversal at the end of lactation. Anat Rec (Hoboken). 2007 Jan. 290(1):65-73. [Medline]. Tompkins KA. The osteoimmunology of alveolar bone loss. Connect Tissue Res. 2016. 57 (2):69-90. [Medline]. Saltel F, Chabadel A, Zhao Y, Lafage-Proust MH, Clézardin P, Jurdic P, et al. Transmigration: a new property of mature multinucleated osteoclasts. J Bone Miner Res. 2006 Dec. 21 (12):1913-23. [Medline]. [Full Text]. McHugh KP, Shen Z, Crotti TN, Flannery MR, Fajardo R, Bierbaum BE, et al. Role of cell-matrix interactions in osteoclast differentiation. Adv Exp Med Biol. 2007. 602:107-11. [Medline]. Li X, Qin L, Bergenstock M, Bevelock LM, Novack DV, Partridge NC. Parathyroid hormone stimulates osteoblastic expression of MCP-1 to recruit and increase the fusion of pre/osteoclasts. J Biol Chem. 2007 Nov 9. 282 (45):33098-106. [Medline]. [Full Text]. Balcerzak M, Pikula S, Buchet R. Phosphorylation-dependent phospholipase D activity of matrix vesicles. FEBS Lett. 2006 Oct 16. 580(24):5676-80. [Medline]. Boskey AL. Noncollagenous matrix proteins and their role in mineralization. Bone Miner. 1989 May. 6 (2):111-23. [Medline]. Miller EJ, Gay S. The collagens: an overview and update. Methods Enzymol. 1987. 144:3-41. [Medline]. Marks SC Jr, Popoff SN. Bone cell biology: the regulation of development, structure, and function in the skeleton. Am J Anat. 1988 Sep. 183(1):1-44. [Medline]. Leblond CP. Synthesis and secretion of collagen by cells of connective tissue, bone, and dentin. Anat Rec. 1989 Jun. 224(2):123-38. [Medline]. Maclean F. Joints. Mills SE, ed. Histology for Pathologists. 5th ed. Philadelphia: Wolters Kluwer; 2020. Chap 5. Owen M. Histogenesis of bone cells. Calcif Tissue Res. 1978 Aug 18. 25 (3):205-7. [Medline]. Sivaraj KK, Adams RH. Blood vessel formation and function in bone. Development. 2016 Aug 1. 143 (15):2706-15. [Medline]. [Full Text]. Kylmaoja E, Nakamura M, Tuukkanen J. Osteoclasts and Remodeling Based Bone Formation. Curr Stem Cell Res Ther. 2016. 11 (8):626-633. [Medline]. Ligato A, Nelson S, Bengs BC. Hip resurfacing as treatment for synovial chondromatosis. Orthopedics. 2010 Mar. 33 (3):198-200. [Medline]. The authors and editors of Medscape Reference gratefully acknowledge the contributions of previous author Yi Jun Yang, MD, to the development and writing of this article.